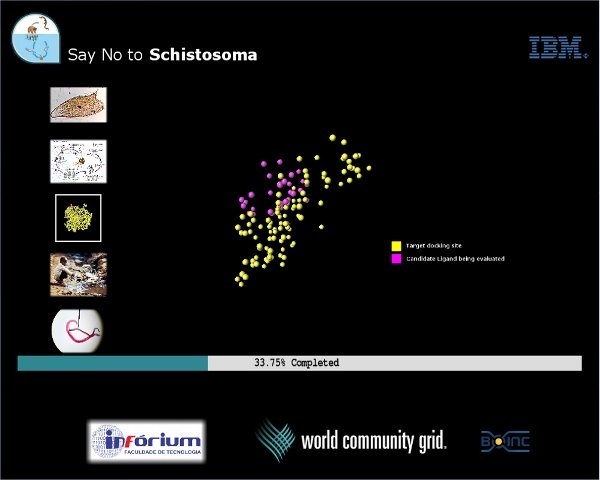 The FightAIDS@Home team is working with the World Community Grid technical team to create a new sampling protocol, which will more closely predict the binding strengths of potential drugs to their HIV protein targets as determined in real-life experiments. Read about this work, and other news, in this extensive update. 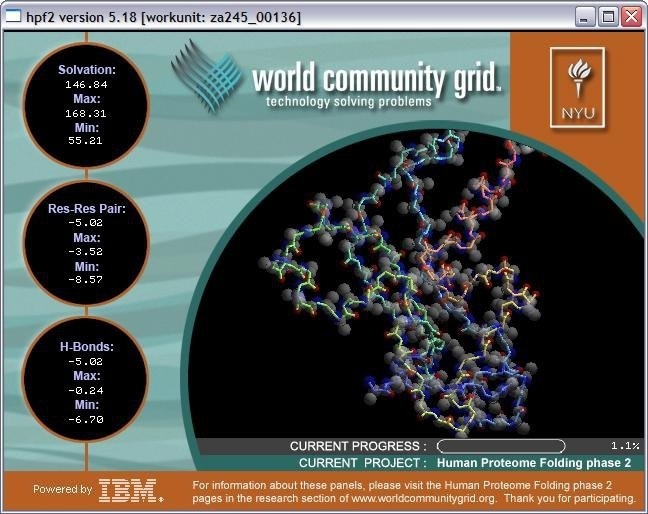 The simulations running under FightAIDS@Home – Phase 2 have been using two new simulation methods (independent sampling and lambda scheduling) that we tailored for the unique computing environment of World Community Grid. While volunteers have been crunching away, we have been diligently analyzing the results returned to us to determine whether these new protocols are sufficient to both meet our scientific goals and provide the volunteers with efficient, worthwhile computing tasks. The results for the first 106 batches show qualitative agreement with prior benchmarks run on high-performance computing clusters, but some results demonstrate the new simulation protocols are not satisfactory for all types of analysis. 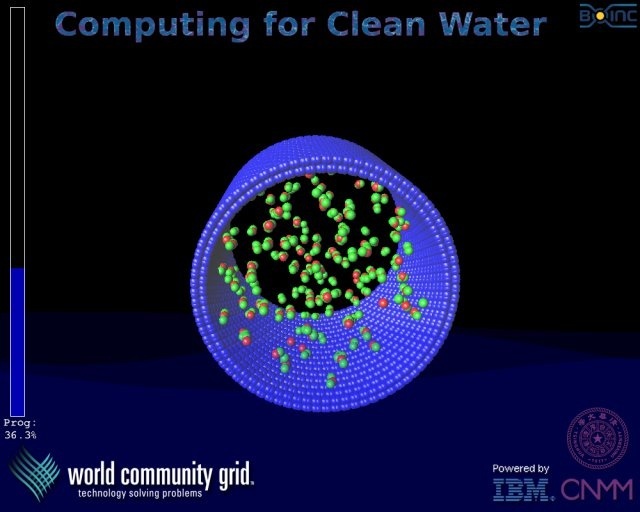 With the support of our collaborators at the HIV Interaction and Viral Evolution Center (HIVE) and the World Community Grid team, we have been working closely with the World Community Grid software developers to implement a more rigorous simulation scheme that closely mimics the more algorithmically efficient simulations run on non-grid computing resources. This new sampling protocol is called asynchronous replica exchange. 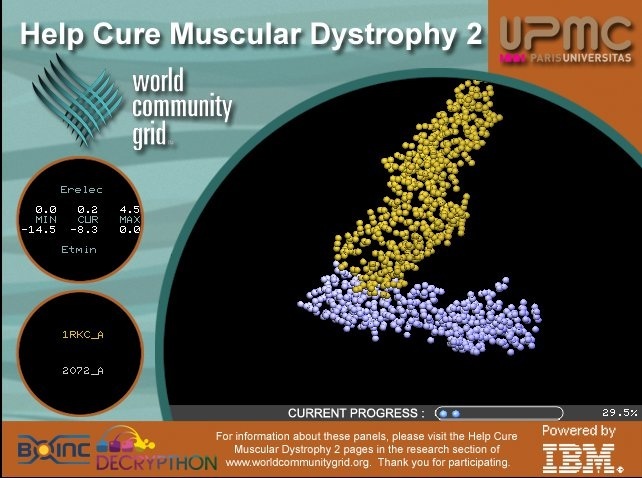 Our Current Process: Currently, multiple copies of a protein-ligand complex (the structure consisting of a drug candidate compound docked with a protein receptor) are sent out to many volunteers and are simulated with no interaction with one another. The collective information from all those simulations are combined during analysis at the very end. The New Process: Asynchronous replica exchange allows information from the different copies to be shared and exchanged among all copies dynamically after short periods of simulations, and this process yields the correct equilibrium statistical physics needed for our analysis. Benefits of the New Process: Replica exchange drastically increases the efficiency of the computations. This means that, in addition to being more valuable in terms of analysis, (a) future work units will have shorter runtimes, making Phase 2 computations accessible to more volunteers; (b) the number of batches running simultaneously can be increased; and (c) each batch will have shorter total simulation times. 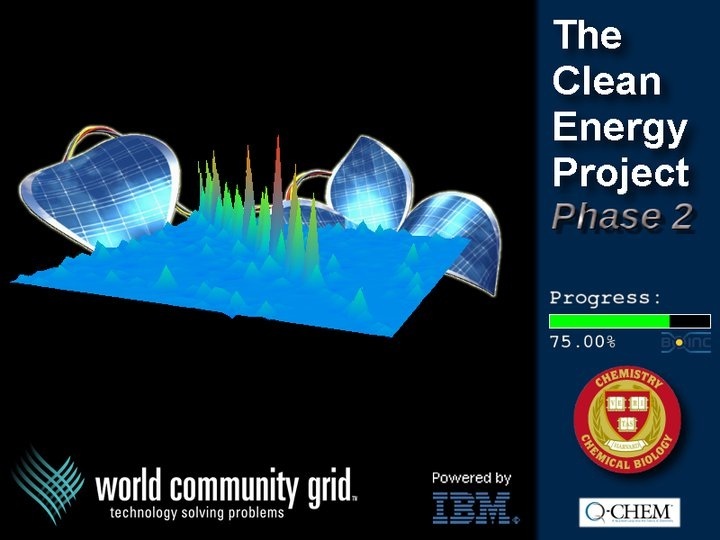 This new technique was first prototyped and then put to use on our local BOINC-powered grid at Temple University. Now, the World Community Grid software developers are working hard to implement the same technique on the World Community Grid platform. This effort would allow the largest replica exchange simulations (by two orders of magnitude) ever performed, and we anticipate testing to begin in the next few weeks. In the meantime, we will continue to run and extract valuable information from simulations using our current algorithms. 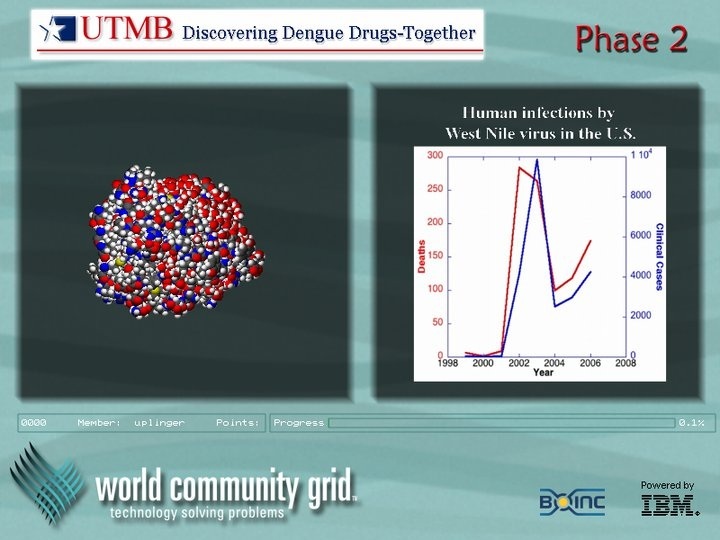 We are moving away from benchmarking simulations, and we are working closely with our collaborators and long-time FightAIDS@Home – Phase 1 research scientists at The Scripps Research Institute to collect the best hits from the many virtual screens performed over the last decade. 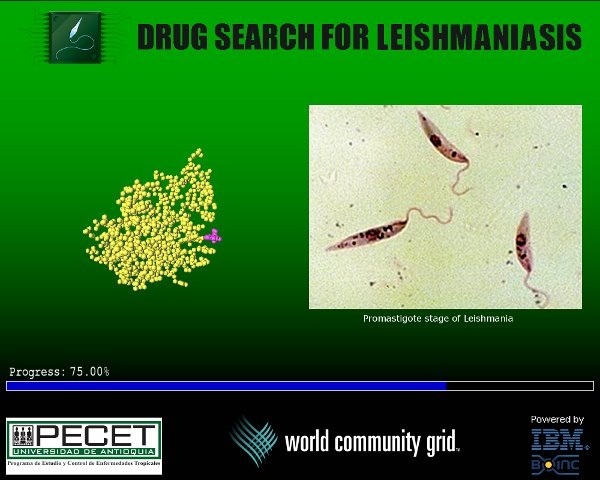 We are in the process of preparing the input files for the top candidates from over 35 million compounds screened in Phase 1 from the ZINC library, a free database of commercially available compounds for virtual screening. Over the next set of batches, volunteers can expect to see research tasks that are geared toward refining the Phase 1 results. Figure: (Left) ALLINI KF116 (green) bound at the interface of two Catalytic Core Domain (CCD) subunits of HIV-integrase. (Right) ALLINI-2 (green) facilitating interactions between the CCD dimer and the C-Terminal Domain (CTD) of another HIV integrase molecule. Due to the presence of the ALLINI, the interaction between the CTD of one Integrase dimer and the CCD-CCD interface of another Integrase dimer is stabilized; chains of these inter-subunit interactions lead to aggregates. 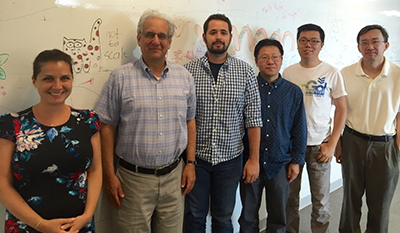 An exciting study regarding computational modeling of HIV has come out of a collaboration with our lab and experimentalists at the HIVE Center. HIV Integrase is a viral protein which plays a critical role in the replication of the HIV virus. A class of compounds, called allosteric Integrase inhibitors, or ALLINIs, has a unique inhibition mechanism targeting HIV Integrase. ALLINIs act like a glue that causes many Integrase molecules to become tangled together and make it difficult for them to complete their normal job, which is to incorporate HIV viral DNA into the cell’s own DNA. Research scientist Nanjie Deng, an associate research professor with the Ron Levy Group at Temple University, has demonstrated with molecular dynamics simulations of HIV Integrase dimers how this process, which is called multimerization, is promoted by the ALLINIs. Deng’s predictions appear to be confirmed by a high resolution crystal structure which will be available later this year. An accelerated publication of his work can be found here. We appreciate the support this project has received from World Community Grid volunteers around the globe.